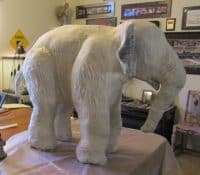 I received an email last week from Linda Backer, with photos of the baby elephant she just finished making. 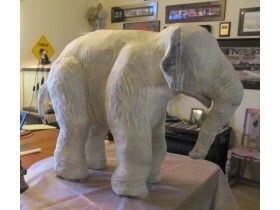 She used the baby elephant video and pattern that I posted here on the blog back in 2009. The video has now been seen by over half a million people, and continues to be the most popular video on my YouTube channel. 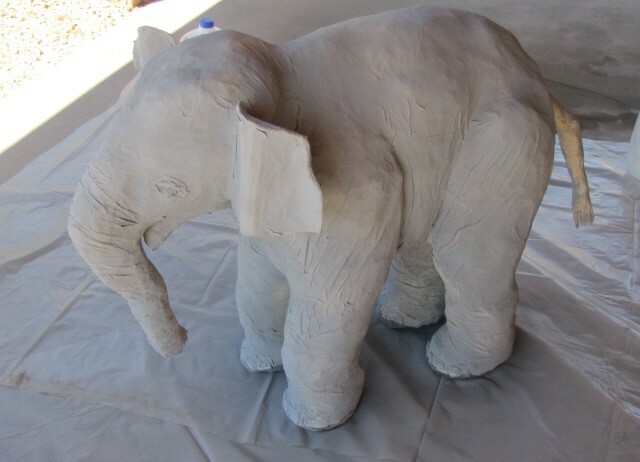 Linda did a great job with her elephant, and she took great photos while she was doing it. Not only that, but she kept track of the costs of her project, too. I asked if she’d be willing to let me show you how her elephant came out, and she graciously agreed. Thanks, Linda! 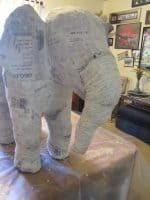 My elephant is done! 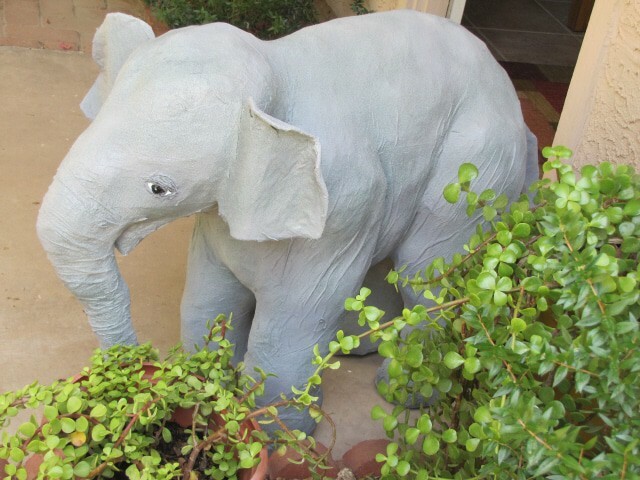 (still awaiting a name…) And has taken residence by my front door eating elephant bush (naturally!). 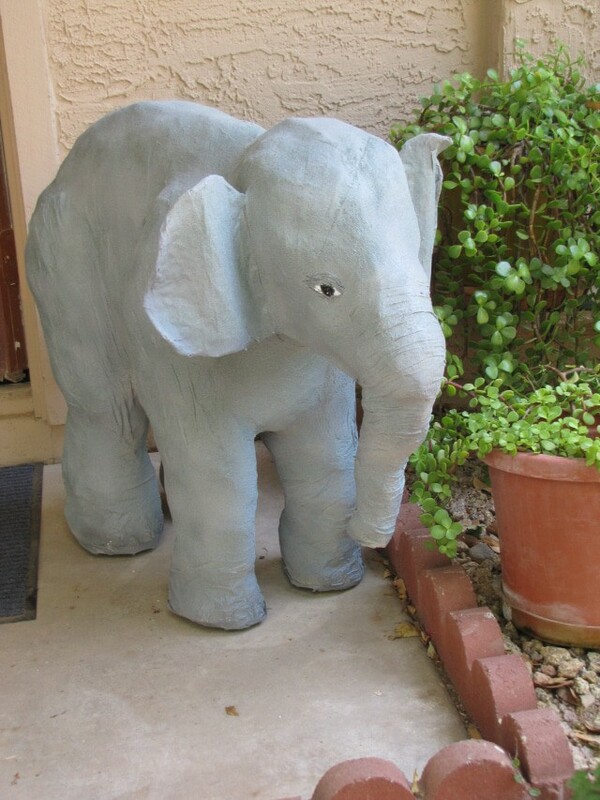 I’ve never done paper mache before, and don’t have any artist supplies, so I did opt to spray paint at the end (used a light gray primer, then a coat of granite, textured spray paint before clear coat. My ears are not quite authentic Indian (trace of African), but wanted the flared appearance. It was a lot of work and determination, but I never could have done it without your pattern, video, website, and SUPPORT! At 66 years old/young, I have more arthritis in my thumb joints and tops of hands than I like to admit, so I think the hardest part was all the tearing of masking tape! 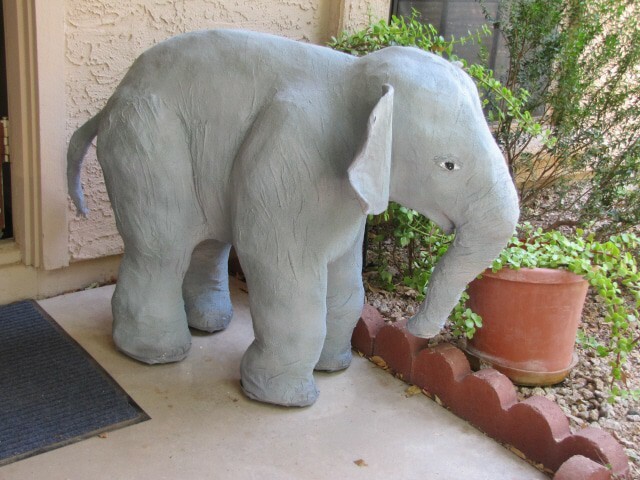 The elephant is on our front gated patio and underneath the roof, so protected from any rain we get in the desert. Many thanks again for all you give and share on your website and your personal attention to our needs! My newspapers were free (subscribe daily); I had jig saw, wood screws and sandpaper. I’m sure your paint mixing gave a better “skin” but not having any supplies, and being a bit tired at conclusion, I went with the spray cans. 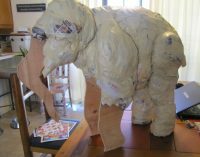 The plywood pattern for the baby elephant. Adding crumpled paper and masking tape. Adding the ears with aluminum mesh and masking tape. 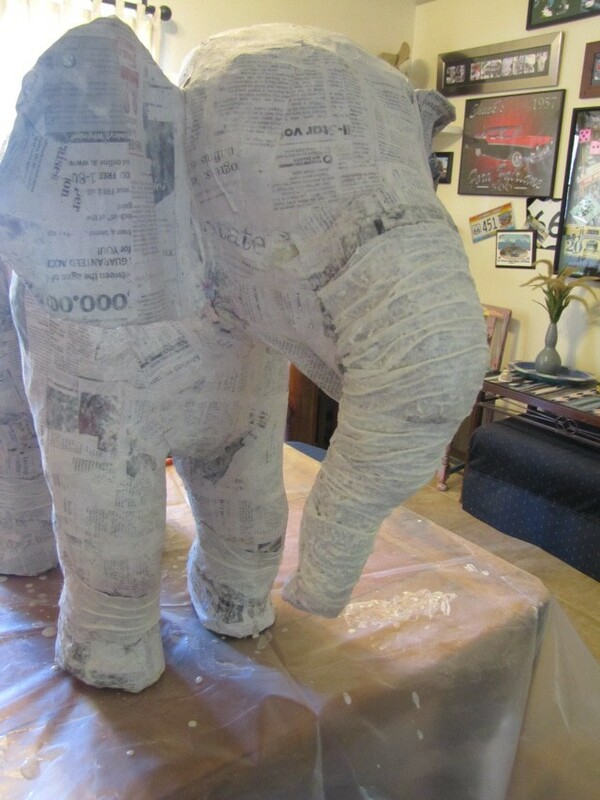 Applying the paper towel “skin” over the paper strips and paste, to create texture and wrinkles. 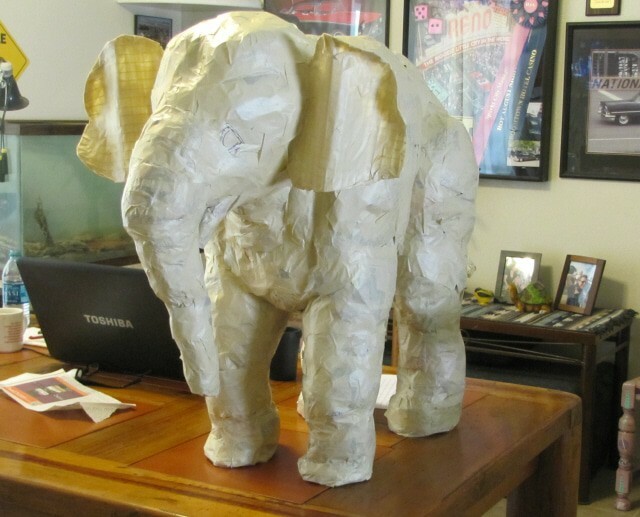 The paper mache is done, ready to paint. First coat of grey paint. Linda, is that the elephant grass the baby is looking at? It looks like she’s ready to take a bite. Want to Make Your Own Elephant? Click here to see the life-sized baby Indian elephant (and many other patterns) available for instant download, so you can start your project today. Hi Jonni, I like your little elephant, but have a question on the 2×4’s you used; It looked like you used two pieces on each side in the front and one on each side in the back? Is that what I’m seeing? Hi Gary. 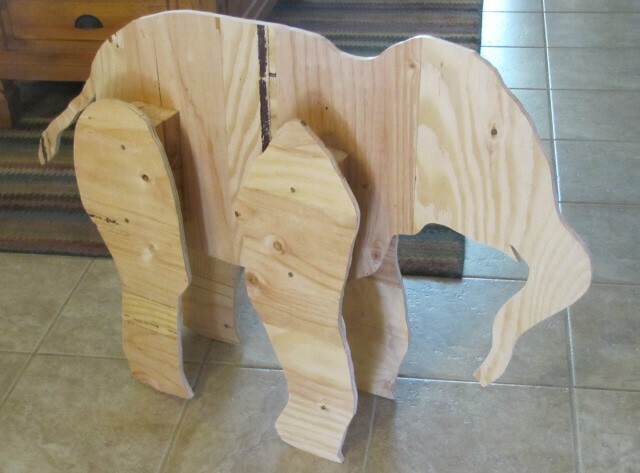 I used two pieces of 2×4’s for all four legs, on my life-sized baby elephant.